Herzog Zwei is a 1989 real-time strategy game that puts two commanders against each other on a wide variety of maps and environments. Each player controls a Mech that can transform from a fighter jet to a walking bi-pedal robot. Released by Technosoft for the Sega Mega Drive/Genesis console, it is credited for pioneering the RTS and MOBA genres. It was also a precursor to the hero shooter genre. Herzog Zwei (ヘルツォーク・ツヴァイ Herutsuōku Tsuvuai) is a real-time strategy video game developed by Technosoft for the Sega Mega Drive/Genesis home console. It was designed by Osamu Tsujikawa, and published in Japan by Technosoft in 1989 and in North America and Europe by Sega in early 1990.It is the sequel to Herzog, which was released only in Japan for the MSX and PC-88 personal computers in 1988. It was the second and last game in the Herzog series. It was later released again in 1991 in limited quantities. The game tasks the player with building a military force in what became to be typical Real Time Strategy fashion in an attempt to destroy the enemy base. The game could be played against the computer or against another human player via split-screen play, which while providing each player view of their enemy tactics, still kept the action moving at a fast pace. The game is often regarded as the first real-time strategy game, and was a major influence on Dune II. Herzog Zwei combined the fully real-time, fast-paced, arcade-style action gameplay of Technosoft's own Thunder Force series with a fairly easy-to-grasp level of strategy gameplay. It differed significantly from both turn-based strategy and real-time tactics, and is the earliest example of a game with a feature set that falls under the contemporary definition of modern real-time strategy.Along with a single-player mode against a computer opponent, it featured a split-screen two-player mode where both players are in action simultaneously and there are no pauses while decisions are taken, forcing players to think quickly while on the move. Though the player only controls one unit, a transforming mech, the manner of control foreshadowed the point-and-click mechanic of later games. It introduced much of the genre conventions, including unit construction and resource management, with the control and destruction of bases being an important aspect of the game, as were the economic/production aspects of those bases. Upon release, the game received little mainstream recognition, and its novel approach to strategy gameplay polarized critics who were uncertain about what to make of it. It was generally well received by Japanese and European critics, with Computer and Video Games recognizing that its fully real-time, fast-paced gameplay set it apart from other strategy games at the time, while The Games Machine found its mixture of strategy and shoot 'em up elements to be unusual but refreshing. Reactions from North American critics, however, were generally negative, with Electronic Gaming Monthly criticizing it for being too complex, judging it as a flawed shooter rather than a novel strategy game, and giving it some of its lowest review scores for a Genesis game. Years after its release, the game eventually gained a cult following. It has since been considered one of the best two-player Mega Drive/Genesis games, and has been listed among the best games of all time, by Electronic Gaming Monthly, IGN and Next Generation. It has been credited with laying the foundations for the real-time strategy (RTS) genre, predating and influencing the genre-popularizing Dune II. It is also retrospectively considered a precursor to the multiplayer online battle arena (MOBA) genre, which uses a similar formula of each player controlling a single command unit in one of two opposing sides on a battlefield. Herzog Zwei has been listed as one of the most important games ever made by 1UP, while GameSpy listed it as one of the most underrated games of all time. It was also a precursor to the hero shooter genre, as it was the first game to combine shooter and MOBA elements. In a different approach than many modern RTS games, the player controlled a Bi-pedal walking Mech/Flying Jet hybrid that was used to build, order, transport and deploy all of the units. The player had to manage variables such as their available ammo, damage, and fuel (which depleted faster if the player was carrying a unit) all the while commanding an army of tanks, surface to air missile launchers, infantry units, as well as support vehicles and boats on certain missions. To make things even more complicated, the player's Mech could be destroyed by enemy units (SAM launchers being notoriously deadly) or by the other enemy Mech itself. If the player were to be caught carrying any cargo when it was destroyed, the cargo would be lost, and the player would be transported back to their home base. Thankfully being sent back to base was a quick process that shortened any down time to a minimum. Each unit cost a certain amount of resources, which would automatically be replenished overtime. If the player needed more resources, they could always capture one of the many sub-basses scattered across the map. These sub-bases were important, as capturing one not only providing the previously mentioned bonus funds, also provided a new place to pick up and deploy units, as well as a place to re-fuel and re-arm the player's Mech. Of course there were risks to expanding, as it not only spread the player's units thin (a unit number cap of 50 units was set for both players), but the sub-bases could also be captured by the enemy, which meant defenses needed to be set to keep the enemy at bay. Of course those defenses took away from the total available units, which placed a greater emphasis on good and effective strategy and less on steamrolling the enemy with accumulating a massive military. The unit types within the game are as follows: Infantry, Motorbike, Supply Truck, Armored Car, Tank, S.A.M., Gatling Gun, and Boat. The infantry unit is pretty weak in terms of offensive power, but it also serves an important purpose. The infantry unit is the only unit that can capture expansion bases, which provide extra deployment points. Infantry units also require no supplies. A very quick unit that specializes in movement over power and armor. Relatively cheap, but the downside is that the armor and weapon power is relatively weak. A good harassment tool. A unit with no defenses of its own, the supply truck is the games basic support unit. It automatically seeks out units with low supplies and replenishes them. An additional way to help units in addition to doing it manually. The basic light attack unit of the game, the key strength of the armored car is the high amount ammunition it carries, even though it sacrifices that for overall power. At about half the cost of the tank, it makes a great unit for a quick strike. The backbone of any Herzog Zwei military attacking force, an army of tanks is a scary sight for any base defenses. High armor and high weapon power, the downside comes from mobility and cost. Surface to Air Missile launchers (S.A.M.) are a great way to keep enemy Jets at bay. The missiles are very powerful, often killing an opponent in a few hits. A good expansion base defense. However, they have no ground attacks what-so-ever. Only available on maps with water, the boat is often overlooked as a great way to attack an enemy's main base. it has a lot of supplies, and decent attack power. Plus they can only be attacked by nearby land. The boat is limited by the amount of area it can attack from. The most costly unit in the entire game, the gatling gun is the best main base defense unit an army can have. Not only is the primary ground fire very effective, but it also has missiles much like the S.A.M. (though they travel slower than the S.A.M. 's missiles). The cost may be prohibitive, but the trade-off is worth it, just make sure they aren't destroyed. Upon release, Herzog Zwei was not very commercially successful and received little mainstream recognition, due to its lack of marketing, relatively early release on the Mega Drive/Genesis platform, and non-arcade genre on what was considered an arcade-oriented game console. Upon its 1990 release in North America, Electronic Gaming Monthly (EGM) harshly criticized the game for being too complex and judged it as a flawed shooter rather than a novel strategy game. They gave it an average rating of 4.25 out of 10, or 17 out of 40 overall, based on a panel of four individual reviewers giving it scores of 4, 6, 4, and 3 out of 10 (see Electronic Gaming Monthly, 1993 Video Game Buyer's Guide, page 46). The game received some of the lowest scores the magazine had ever handed out to a Genesis game; 3 out of 10 was the lowest score any Genesis game had received from EGM reviewers up until 1993, and Herzog Zwei was one of only six Genesis games to have received this score up until then (see Electronic Gaming Monthly, 1993 Video Game Buyer's Guide, page 46). In Japan, the game was generally well received by Famitsu, which gave it a score of 29 out of 40. ''Famitsu'' compared it to Nectaris and Famicom Wars, but noted that Herzog Zwei distinguished itself with its simultaneous, two-player, real-time gameplay. The game was generally more well received by European critics. In the United Kingdom, Warren Lapworth reviewed the game in the March 1990 issue of The Games Machine magazine, giving the game a 75% score. He criticized the title as "one of the silliest" names he had seen for a video game, but described the game itself as an "unusual product," a console strategy game with shoot 'em up style gameplay, stating, "Whether it's intended to get strategists to consider buying the console or to broaden the horizons of trigger-happy lunatics, I don't know. Either way, it's quite refreshing and can be quite addictive in two-player mode, fierce rivalry developing between friends." In the April 1990 issue of Computer and Video Games, reviewer Paul Glancey gave the game an 82% score. He described it as "a game of conquest between two commanders in real time" and recognized that what "sets it apart from other strategy games is that everything happens in real time. Both players are in action simultaneously and there are no pauses while decisions are taken so you have to think on the move or die." He noted that the command icons are "fairly easy to grasp" and concluded that it is a game that helps establish the Mega Drive as a "real" computer rather than "just a machine for immobilised arcade players." Its highest rating from a British magazine was from Mega Drive Advanced Gaming, which gave it an 85% score. In France, the game was reviewed in the November 1990 issue of the Joystick magazine, where reviewer JM Destroy gave the game a 78% score. The game was particularly well received in Germany, where critics referred to it as simply Herzog 2, with Power Play magazine giving it an 80% score in its April 1990 issue, while Play Time gave it an 85% score in its June 1991 issue. Long after its release, the game gained a cult following and achieved some popularity. David Filip of Allgame gave the game a score of 4 out of 5 stars, describing it as "one of the first" and "one of the best" strategy video games on home consoles and as "a fine cure for those days when you want a different kind of RTS to control." Daniel Thomas of Sega-16 gave it a score of 10 out of 10 in 2004, describing it as "very probably the finest videogame you've never played" and as the Genesis console's "finest hour." Lawrence Wright of Insomnia gave the game a score of 5 out of 5 stars in 2008. GameSpot users have given Herzog Zwei an average score of 8.8 out of 10, as of 2009 and 2015. It is often found on several "best games of all time" lists, owing to its precedence in the real-time strategy genre, as well to the increasing understanding of finer points of its mechanics. It was featured in the "Top 100 Games Ever" list of Electronic Gaming Monthly, in the November 1997 issue which ranked it at #43 (by a different editorial line-up from years earlier), and in the January 2002 issue which ranked it #52. The February 1999 issue of Next Generation ranked it at #39 in its list of 50 best games of all time. It has also been featured in IGN's "Top 100 Games of All Time", in the 2003 list which ranked it at #62, and in the 2005 list which ranked it #95. In 2003, GameSpy listed the game as one of the 25 most underrated games of all time. 1UP included the game in its "Essential 50" list of "The Most Important Games Ever Made". The U.S. game release packaging art was executed by veteran San Francisco game box illustrator Marc Ericksen, who had previously done the art for Thunder Force II, and was invited back by Sega for this image, as it was considered a 'sister' game to TFII.A sequel was planned for Sega's 32X platform, but with the subsequent failure of that console, so, too, died the plans for a third Herzog title. With Technosoft closing its doors in 2001 and the status of the intellectual property being unknown, the future of the series is likely sealed. Scott Sharkey of 1UP states that, besides the original Herzog, earlier strategy games were "fairly primitive and abstract by comparison," that earlier such games lacked the ability to construct units or manage resources which made them "much more tactical than strategic," and that the slower processors and modems made the ticks "so long that the games were practically turn based". 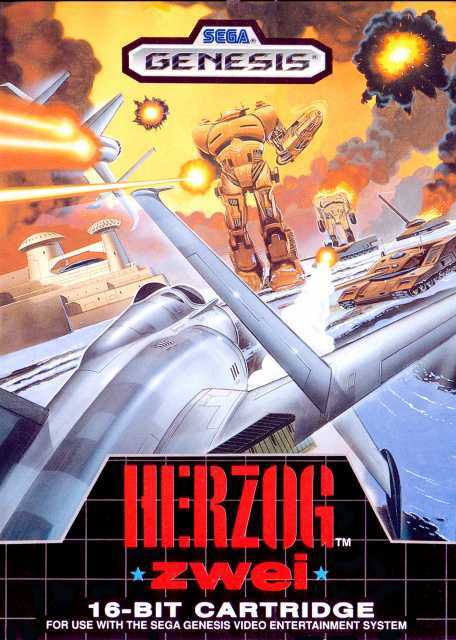 Herzog Zwei went on to influence future RTS games, particularly Dune II (1992), the producers of which acknowledged Herzog Zwei as an influence, as well as Warcraft (1994), Command & Conquer (1995), Starcraft (1998), War of the Ring (2003), and Brütal Legend (2009). Future Cop: LAPD (1998) featured a Precinct Assault mode that was similar to Herzog Zwei. Total Annihilation (1997) and its spiritual successor Supreme Commander inherited the concept of a large robotic command vehicle which is used to construct and command an army. The roots of the popular multiplayer online battle arena (MOBA) genre, also known as the action RTS genre, has been traced back to Herzog Zwei, which used a similar formula, where each player controls a single command unit in one of two opposing sides on a battlefield. Destructoid cited Herzog Zwei as "one of the world's first MOBAs." In 2008, GameAxis Unwired considered DotA to then be the closest modern equivalent to Herzog Zwei, but noted that, while DotA gives the player control over a fully customizable command unit with RPG elements, it severely limits or removes the player's ability to produce and command other friendly units, whereas Herzog Zwei has a fully customizable command unit with RPG elements that the player has full control over, while commanding an army to go into battle with rather than mindless drones that respawn at set intervals. More recent popular examples of MOBA games include Dota 2 and League of Legends. In 2004, a mod was created for Unreal Tournament 2004 attempting to recreate Herzog Zwei. In 2008, Guilty Gear 2: Overture used strategy gameplay similar to Herzog Zwei. On November 8, 2012, Carbon Games released AirMech, a MOBA game that is considered a more direct spiritual successor of Herzog Zwei. It features modernized graphics and added gameplay mechanics, such as online multiplayer. The game has been released under a free-to-play model, and is available from Carbon Games, Steam, and the Google Chrome Web Store.